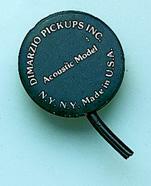 Based in Staten Island, New York, DiMarzio offers a complete line of accessories for stringed instruments. This acoustic contact transducer is sold as a guitar pickup, but I have little doubt it will work on a mandolin. To learn more, visit the DiMarzio Web site.